Dr. Patrick El-Khoury received the Ronald L. Brodzinski Early Career Exceptional Achievement Award from Pacific Northwest National Laboratory. The award recognizes his work in advancing ultrasensitive molecular spectroscopy and nanoscale chemical imaging. His achievements include developing a unique tip-enhanced Raman nanoscope. This device allows multimodal chemical imaging of (bio)materials with joint nanometer spatial resolution and single molecule detection sensitivity. To date, he has co-authored more than 50 journal articles, including invited reviews in the emerging investigator showcases in Chemical Communications and Analyst. Before coming to PNNL as a Linus Pauling Distinguished Postdoctoral Fellow, he completed postdoctoral training at the University of California, Irvine. 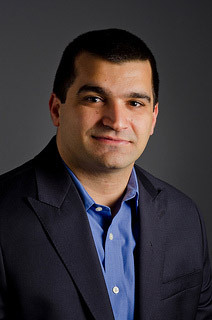 He earned a Ph.D. in photochemical sciences from Bowling Green State University and a bachelor's degree in chemistry from the American University of Beirut.